In recent years, the mathematical research in the field of inverse problems for imaging has gained a considerable interest, thus receiving a significant boost and producing remarkable advances for real-life applications. Indeed, despite the huge improvement in the hardware imaging systems, the analysis of imaging models and the study/implementation of efficient numerical methods remain fundamental elements to tackle innovative imaging applications, arising from very different domains of applied science, such as medical imaging, microscopy, astronomy, etc. The school titled “Computational Methods for Inverse Problems in Imaging” offers an introduction to the computational methods nowadays available for the solution of imaging inverse problems. It is open to all aspiring scholars in any area of science or engineering who are interested in studying the computational and theoretical aspects of the solution of inverse problems in imaging. The school is especially addressed to doctoral students and young postdoctoral scholars. 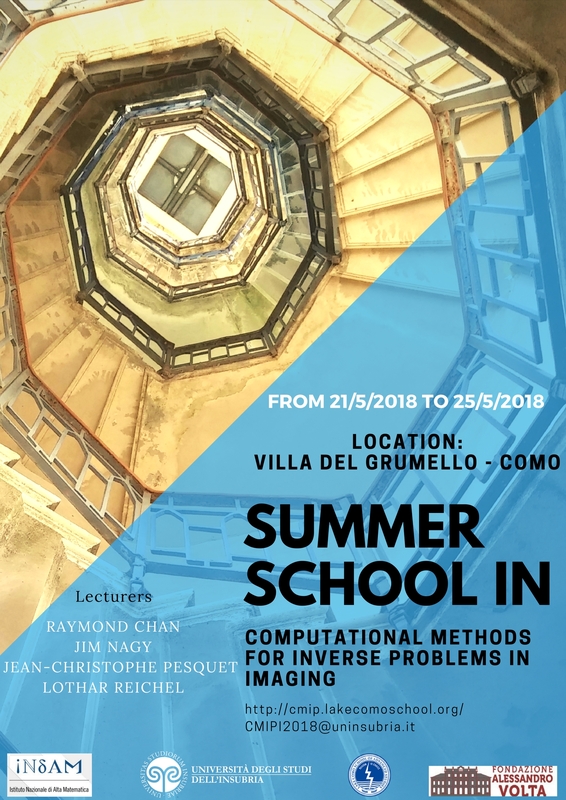 This school is the opening event of the INdAM intensive period “Computational Methods for Inverse Problems in Imaging“, which will continue until 20th July at the Department of Science and High Technology of the University of Insubria.